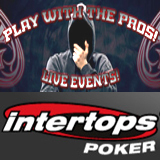 This weekend Intertops Poker players get their last chance to qualify for the European Deepstack Dublin and to play with the pros. Players can win their way to the final this Sunday for as little as $2+0.20, the last satellites run this weekend on January 18th and 19th. The Final this Sunday January 20th rewards the winner with a $3500 European Deepstack Dublin prize package.